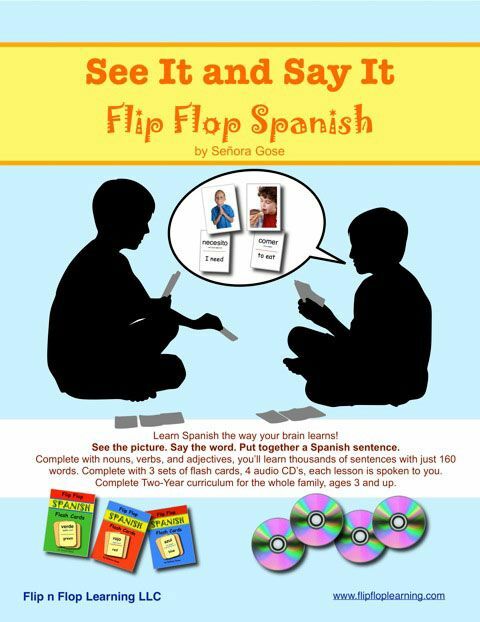 Flip Flop Learning is home to several language programs, including See It and Say It Spanish! See It Say It Spanish is truly for the entire family from age 3-93. Who doesn't love a language program that you can all use? One of our church families recently adopted from Costa Rica a sibling group of three children who speak Spanish. We thought this would be a fantastic product to help us try to pick up some Spanish to speak with them as they transition to English. Plus as our church continues to send mission teams to Costa Rica, the opportunity for the kids to utilize it are quite reasonable. My three youngest; 5, 8, 11 and I, started this program together. It is so straight forward and organized! Both the Audio CD and the book tell you exactly what flash cards to use and what words you will be working on. The Flash Cards include 160 words. Each flash card has a photo on the front, and the Spanish word on the back. The photos help us to visualize the word and be able to correspond the Spanish sounds to that word. We are introduced to words right away that we can put together to make a sentence. Granted my boys didn't care for Skirt being in the first line up but they did like the Ice Cream word! Flash Cards sell for $8.95 each and are also included in the package See It Say It for $99.00. I very much enjoyed how everything in this program was right there at my finger tips. I didn't have to look up something online, download files, or search for specific books. It comes all packaged together so you just grab the Cd player and are mobile to use the program. The lessons are broken down into 3 parts, to be done in 3 days. This gives you the daily repetition you need to remember. The first lessons are rather quick, so we did combine lessons to move more quickly through the flash cards. My kids were much more able to retain the words than I was! Definitely reason for young kids to start learning another language, they are just little sponges. Seniora Gose has a wonderful voice and is very easy for the kids and I to understand. I find that to be key when we are learning another language, that the English portion of the instruction is understandable. Seniora Gose really does an excellent job at making it interesting and fun. There are also tips and techniques online HERE to help you will additional practice. See what the other Review Crew Members thought of Flip Flop Learning's program by clicking on the banner below.